Swihart is without options, so his expulsion from the big-league roster all but ensures he's headed to another team over the coming days through a trade or waiver claim. Consider it surprising, then, that this is how things end between Swihart and the Red Sox. After all, Boston went through the trouble of carrying three catchers last season. Theoretically, they could have done the same this year -- except their poor pitching has necessitated rostering 13 pitchers at a time, limiting them to a three-man bench. The Red Sox had to choose between Swihart and Leon. Originally, they chose Swihart. Yet a couple weeks into the season, they've reversed their decision. This time, there's no going back. In many ways, Boston's decision makes sense. Leon is regarded as a well-above-average defender, and thereby far superior to Swihart behind the plate. The Red Sox need their pitching to get right if they're going to turn things around. Installing a premium defensive backstop should help -- especially when that catcher has a good rapport with Chris Sale, among others. Beyond that, you sense that the idea of Swihart had outgrown the reality. He's a former top prospect, sure … but he's 27 with a career 82 OPS+ in 500 big-league plate appearances. He hasn't settled in as a worthwhile defender (a fair amount of the blame for this belongs to the Red Sox, who moved him around the diamond), so he needs to continue to develop on both sides if he's going to serve as more than a notable name. At the same time, Swihart is assuredly a better hitter than Leon, and he hasn't had the opportunity to play every or most days. 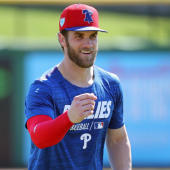 You can envision a scenario where he gets a look with the Baltimore Orioles or the Kansas City Royals or any number of other rebuilding teams and turns into an appreciable member of the roster -- or, at least, someone who can provide value against right-handed pitching without serving as a sieve behind the dish. Is that worth the fuss this move generated? Maybe not. But when the World Series champions get off to a start this poor, you can expect anxiety. Unfortunately, for Swihart and his Boston-based fans, that anxiety can precipitate some surprising roster moves.